You've all heard me once if not a thousand times, your gut plays such a significant role in your overall health and wellness but most do not understand the impact the gut has on your overall thyroid function. Gut challenges are one of the most overlooked symptoms in our culture today. We think it is normal to walk around bloated, gassy, constipated, and uncomfortable. It seems normal because everyone else we know is living with this on some level. Trust me, it is not normal. So how does this tie into your thyroid function? Understand first that the lining of your gut is a very important immune barrier. If this barrier is not healthy, this is one of the most significant factors in autoimmunity and autoimmunity is one of the biggest core factors in thyroid challenges. We discussed this a few weeks ago in the article "Gluten and Autoimmunity." 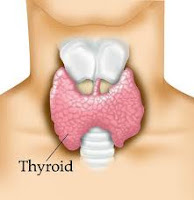 Also remember from another recent article on the thyroid "Thyroid Treatment...Ridiculous!" we discussed the fact that 20% of your T4 is converted to T3 in your gut due to healthy gut flora. You guessed it, this does not occur with poor gut function. Another common symptom of poor gut function is constipation. Let me first define constipation. This is anyone that does not have at least two healthy bowel movements per day. Yes, I said two. If you are one of those that feels that your colon is working well at one bowel movement per day, you've got another thing coming. Among other challenges if you are constipated, it makes life much more difficult hormonally speaking. Slow colon release hinders the release of unused hormones and leads to an accumulation of estrogen, which decreases thyroid function. So what do you do to improve the intimate connection between your gut and thyroid? First off, it is a good idea to always take a quality Prebiotic/Probiotic formula, Digestive Enzyme (Prime Digestive Support) and for many adding a Betaine HCL/Pepsin supplement. All three of these can be found at the Depke Wellness Store. This would assist with healthy bacteria, predigestion early in your stomach and proper breakdown later in your stomach prior to being released into the small intestines. From here you want to focus on your nutritional choices. The typical favorite foods of many in our culture are also the leading causes of poor gut integrity such as sugar, ice cream, pasta, bread, corn products, alcohol and pasteurized dairy products. Below is a list of all potentially inflammatory foods to review. Basically anything that leads to inflammation in your gut leads to hormonal imbalance. This of course effect your thyroid function. Remember, your thyroid needs your gut and in more ways than one. If you have any comments or questions in regard to today's article, please leave this below for me to address personally. sounds great, so after ruling out all those foods can you give a list of what foods you CAN eat to maintain gut integrity. Absolutely...perhaps I can change next weeks newsletter topic to anti inflammatory diets and I'll provide the allowable foods also. Great idea and thank you for the kind words in regard to today's article. Yeah, that's a long list to avoid - some are in my meal plan to, so... I'm looking forward to learning more!